Hemimegalencephaly (HME) is a heterogeneous cortical malformation characterized by enlargement of one cerebral hemisphere. Somatic variants in mammalian target of rapamycin (mTOR) regulatory genes have been implicated in some HME cases; however, ∼70% have no identified genetic etiology. Here, we screened two HME patients to identify disease-causing somatic variants. 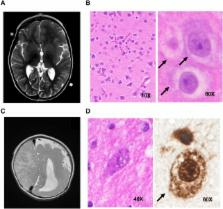 DNA from leukocytes, buccal swabs, and surgically resected brain tissue from two HME patients were screened for somatic variants using genome-wide genotyping arrays or sequencing of the protein-coding regions of the genome. Functional studies were performed to evaluate the molecular consequences of candidate disease-causing variants. Both HME patients evaluated were found to have likely disease-causing variants in DNA extracted from brain tissue but not in buccal swab or leukocyte DNA, consistent with a somatic mutational mechanism. In the first case, a previously identified disease-causing somatic single nucleotide in MTOR was identified. In the second case, we detected an overrepresentation of the alleles inherited from the mother on Chromosome 16 in brain tissue DNA only, indicative of somatic uniparental disomy (UPD) of the p-arm of Chromosome 16. Using methylation analyses, an imprinted locus on 16p spanning ZNF597 was identified, which results in increased expression of ZNF597 mRNA and protein in the brain tissue of the second case. Enhanced mTOR signaling was observed in tissue specimens from both patients. We speculate that overexpression of maternally expressed ZNF597 led to aberrant hemispheric development in the patient with somatic UPD of Chromosome 16p possibly through modulation of mTOR signaling. Motivation: A new protocol for sequencing the messenger RNA in a cell, known as RNA-Seq, generates millions of short sequence fragments in a single run. These fragments, or ‘reads’, can be used to measure levels of gene expression and to identify novel splice variants of genes. However, current software for aligning RNA-Seq data to a genome relies on known splice junctions and cannot identify novel ones. TopHat is an efficient read-mapping algorithm designed to align reads from an RNA-Seq experiment to a reference genome without relying on known splice sites. Results: We mapped the RNA-Seq reads from a recent mammalian RNA-Seq experiment and recovered more than 72% of the splice junctions reported by the annotation-based software from that study, along with nearly 20 000 previously unreported junctions. The TopHat pipeline is much faster than previous systems, mapping nearly 2.2 million reads per CPU hour, which is sufficient to process an entire RNA-Seq experiment in less than a day on a standard desktop computer. We describe several challenges unique to ab initio splice site discovery from RNA-Seq reads that will require further algorithm development. Availability: TopHat is free, open-source software available from http://tophat.cbcb.umd.edu Contact: cole@cs.umd.edu Supplementary information: Supplementary data are available at Bioinformatics online. Data visualization is an essential component of genomic data analysis. However, the size and diversity of the data sets produced by today’s sequencing and array-based profiling methods present major challenges to visualization tools. The Integrative Genomics Viewer (IGV) is a high-performance viewer that efficiently handles large heterogeneous data sets, while providing a smooth and intuitive user experience at all levels of genome resolution. A key characteristic of IGV is its focus on the integrative nature of genomic studies, with support for both array-based and next-generation sequencing data, and the integration of clinical and phenotypic data. Although IGV is often used to view genomic data from public sources, its primary emphasis is to support researchers who wish to visualize and explore their own data sets or those from colleagues. To that end, IGV supports flexible loading of local and remote data sets, and is optimized to provide high-performance data visualization and exploration on standard desktop systems. IGV is freely available for download from http://www.broadinstitute.org/igv, under a GNU LGPL open-source license. This article is distributed under the terms of the Creative Commons Attribution-NonCommercial License, which permits reuse and redistribution, except for commercial purposes, provided that the original author and source are credited. Novel use of a chimpanzee pseudogene for chromosomal mapping of human cytochrome c oxidase subunit IV. Sequence diversity and chromosomal distribution of "young" Alu repeats.